I am inspired to design simply beautiful handbags that blend function with fashion, to create time-saving, life-changing bags designed for real people to meet real needs. While many of today’s handbags are heavy, oversized bottomless pits that are loaded with decorative hardware, my sophisticated designs keep your shoulders and back healthy, with quick access pockets for your essentials to save you precious minutes everyday. Streamlined silhouettes deliver sophisticated elegance, with every bag designed for hands-free usage. 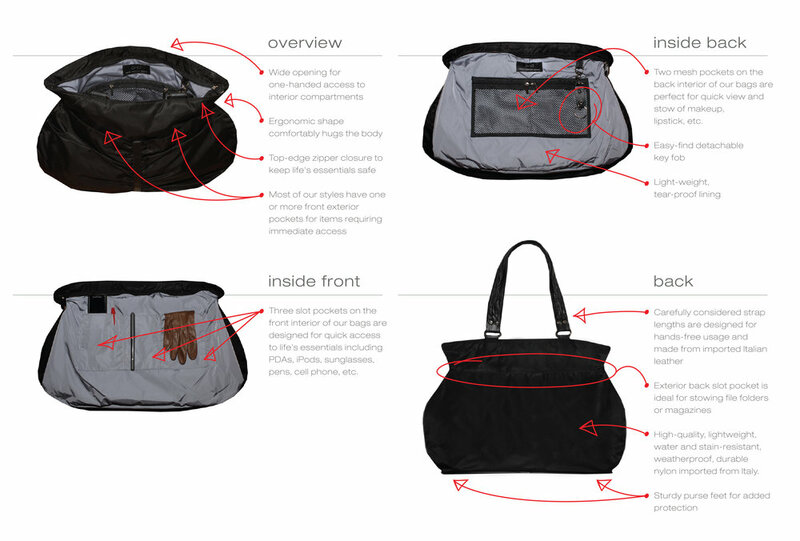 Myriad details are carefully considered: lightweight, durable, water- and stain-resistant nylon and leather imported from Italy; functional interior and exterior pockets; strap lengths designed for one-handed access and easy elbow clearance; and an easy-find removable magnetic key fob. Practical function meets beautiful form in handbags designed with everything you need to change the way you carry your life. All products are manufactured in the USA. It’s never too early to discover your own sense of style, and it became clear that fashion would be a huge part of my life when I adamantly started dressing myself at 3 years old. By the time I was 6, my grandmother, also a designer, helped me design and sew fashionable clothing for my Snoopy and Belle stuffed animals. In high school, I found the same styles in every store, so I started designing my own clothes—including my prom dress. It didn’t stop there. I earned a B.A. in Art History and the Sociology of Dress from Boston University, and completed an independent study on the social implications of the corset. I went on to complete a Master’s in Costume History at the Courtauld Institute of Art in London. I discovered that although I loved working in museums with costume collections and on clothing exhibitions, I’m far more interested in designing fashion-forward accessories and clothing that make life easier. I’ve always known that I would be a part of the design community in some way, but the dream of having my own design company grew over the years I spent living and working in London, San Francisco, Boston and New York, sans car and fed up with not having the perfect bag to schlep from home to gym to work to social engagements and back home again. In 2005 I decided it was time to make the dream a reality. I moved to Los Angeles and launched Paige Hamilton Design to create sophisticated, elegant, practical handbags and accessories that strike the perfect balance of form and function.